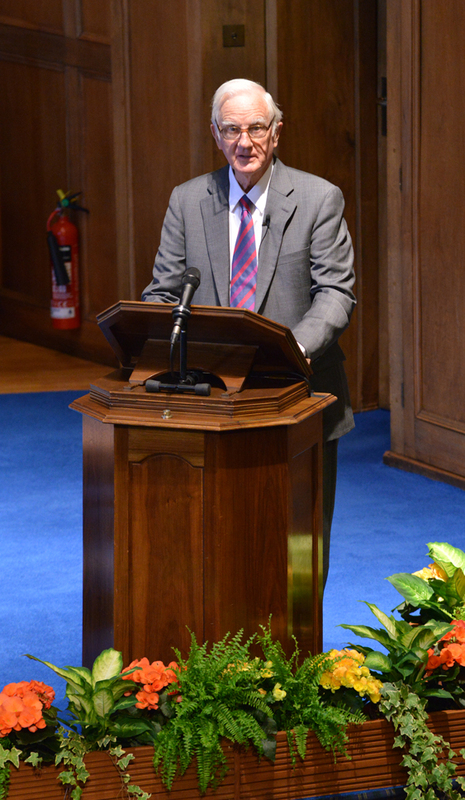 Harvard president emeritus Derek Bok addresses the academic summit during the six-hundredth anniversary celebration for the University of St Andrews on September 14. 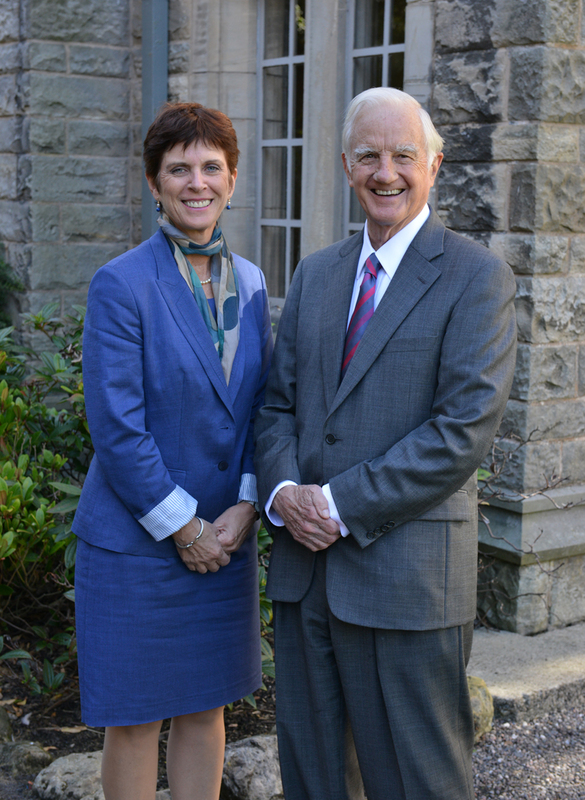 Derek Bok with Louise Richardson, Principal and Vice-Chancellor, University of St Andrews; Richardson was executive dean of the Radcliffe Institute for Advanced Study before moving to Scotland to assume her current post in 2009. His comments come as institutions across the spectrum of higher education, including Harvard through its edX partnership, explore massive open online courses (MOOCs); “flipped classrooms” (in which students view recorded lectures before class, and then work on problems together and with their instructors); real-time analytical tools that enable teachers to judge student command of material, as pioneered by Balkanski professor of physics and applied physics Eric Mazur (profiled in Harvard Magazine’s “Twilight of the Lecture,” whose classroom analytics company—created with Weatherhead University Professor Gary King—was recently written up by the Harvard Gazette); and other educational experiments shaped by technology. Already, the chance to reach much larger audiences has moved many professors to offer their classes online. In doing so, they have had to give up being the sole architect of their courses. They are still the final arbiter of content, but they must now teach as a member of a team composed of technicians, media consultants, and visual experts, among others, who work together to decide how the material should be presented. Something quite fundamental changes when teaching is collaborative. It becomes less intuitive and more a product of conscious deliberation over the host of questions that arise in deciding how best to present each item of subject matter and put it in a proper sequence [emphasis added]. For hundreds of years, only students have known much about how well or badly they are being taught. Technology changes that. In an online course, every statement professors make, every question they ask, and every answer students give can be recorded. By examining this material, instructors can discover much more about what their students are learning easily and what material is giving them trouble. This change alone will make professors more aware of their effect on students and hence allow them to become more proficient in helping students learn [emphasis added]. Why should professors continue giving lectures when their students can easily watch any one of several well-known experts discourse on the same subject online at any hour of their choosing? Faced with such a question, many instructors are likely to give up lecturing and use their classes for other, more active forms of learning, such as problem-solving, socratic discussion, and group projects. These methods should prove more effective than listening to professors talk for giving students a deeper understanding of the subject and helping them to develop the skills of critical thinking and analysis that faculties have long considered the most important goals of a liberal education [emphasis added]. As instructors make ever greater use of technology and start to observe the learning processes of their students, teaching will become less of an art and more a subject to be analyzed and studied. Faculties will recognize that they can no longer prepare their graduate students for an academic career merely by training them to do research. Graduate education will also have to include systematic efforts to prepare students to be effective teachers. [S]tudents can choose among different lecturers teaching the same material via the Internet and listen to the one they find most interesting and helpful. They can skip over parts they know and replay parts that seem particularly hard to understand. In well-structured subjects, such as physics or statistics or economics, computers can be programmed to react automatically to individual learners, allowing those who grasp the material easily to move ahead more rapidly, while giving additional hints and questions to help those in difficulty figure out why they are having trouble and how they can overcome it. Technology will also improve learning by giving students instant feedback to let them know if they have mastered the material [emphasis added]. Bok foresees such changes beyond liberal-arts settings, too. He gives an example of mannequins programmed to introduce medical students to disease symptoms and possible treatments. That and a business-school simulation of real business situations for team teaching are examples of making learning “more interesting,” as are enriching visual materials incorporated in online lectures. Allowing individuals to make more informed choices can be a dubious benefit if their aims are immature or shortsighted. The competition among professors to attract larger audiences via the Internet will not improve the quality of education if students prefer superficial methods of instruction. Having more information about the classes one can choose may not be helpful if students are simply looking for the easiest courses. A Future for Residential Education? Online courses may turn out to do an adequate job of training students for a wide variety of jobs that can be broken down into a set of clearly specified skills and information. Government officials who view universities as essential instruments of economic growth but are dismayed by their mounting cost may be delighted to find a means of vocational training that gets the job done without expensive facilities and large overhead costs. We are a long way from being able to train graduate students to be scientists and scholars by online instruction. The same is true of teaching in fields of knowledge where there are no definite answers but rather a need to ask appropriate questions, use imagination, or see intriguing patterns in a jumble of seemingly disconnected facts. It is also unlikely that online instruction will be able to offer role models to inspire emulation and encourage moral development and far from clear that technology will be able to match living in a residence hall for giving students an appreciation of people from other cultures and religions or an ability to work effectively with persons very different from themselves. Much else that is memorable and important in a college education is not readily reproducible by machine. Rather, it occurs through impromptu conversations with students and instructors, or emerges in seminar discussions from unexpected turns and twists in the conversations that are hard to program in advance [emphasis added]. That may be a comforting synthesis applicable to a young institution like Harvard (at least compared to St Andrews, founded before Christopher Columbus or the Pilgrims sailed west)—where large investments are under way not only to create the online courses of the future through edX but also to renew the College’s residential Houses as places for students to live, interact, and learn with one another. For a report on recent developments at Harvard and elsewhere, see "The Turn in Online Education," published September 5. President Bok's new book, Higher Education in America, will be reviewed in the November-December Harvard Magazine, available online on October 19.